Find out everything you need to know on the new Citroen C4 Cactus from independent vehicle review website Car And Driving. You can watch the video review to the left to see more of the car or read their written review below to get a true insight from an expert in the automotive industry. The stunning C4 Cactus crossover is resolutely modern but is also in some ways a throwback to a time when Citroen was renowned as a design leader. Jonathan Crouch reports. The Citroen C4 Cactus looks unlike any other vehicle on the roads thanks to its Airbump side cladding and a whole host of other bold details. Under the skin, it's much the same as a C3, which isn't quite so avant-garde, but as a comfortable and simple city scoot, it has much to commend it. To the cynical eye, it would seem that there's very little new in car design. In fact, a common refrain with car buyers is that many new cars look the same, all trending towards a common form factor per genre. Citroen clearly doesn't agree. In the past it was a company that dared to be different and brought us quirky, individualistic cars like the DS, 2CV, the SM, the CX and the BX. Even in later years, Citroen showed that it could do things in its own way with interesting stuff like the Xantia Activa, the C6 and the C4. Of course, different doesn't always mean better, and some of Citroen's best efforts were resounding flops. Step forward the C4 Cactus - and its timing couldn't be better. Just when crossover vehicles had become so popular that they had moved from the edgy alternative to a family hatch to become the most mainstream, boring, suburban choice imaginable, Citroen has shaken things up. The C4 Cactus might be a bit too much for a middle-aged school run mum, but I think many others are going to find it to their liking. Despite the C4 nomenclature, under the textured skin of this vehicle are the more prosaic underpinnings of the C3. Despite the car's adventurous styling, there's some real common sense going on here. Economise on the oily bits and go nuts with the shiny bits seems to have been the mantra with this one, so it probably won't surprise you to learn that the C4 Cactus doesn't break any new ground as a driver's car. That's not to say that Citroen hasn't applied its design genius to improving this car's responses. It's extremely light. The three-cylinder petrol model weighs in at just 1,020kg, which is around 200kg less than an equivalent C4, which helps it get the most out of its modest engines. Even the most powerful version gets a mere 1.2-litre three-cylinder petrol powerplant. We've seen this unit before in the Peugeot 208 and the Citroen C3 and it's a cracker that really loves a few revs. 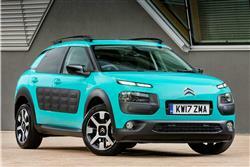 Here it develops 110PS and will get the C4 Cactus to 62mph in 9.3 seconds. It's joined by two other petrol engines ('PureTech 75' and 'PureTech 82' units) and a frugal 'BlueHDi 100' diesel powerplant. Most buyers will stick with the five-speed manual gearbox, although five and six-speed Efficient Tronic Gearboxes (ETG) are also on the menu. Citroen has engineered the suspension set-up for comfort rather than outright handling focus and the power steering is geared towards ease of use in cities. They're called 'Airbumps' in case you were wondering. Looking for all the world like a pair of puncture repairs on the side of the C4 Cactus, these thermoplastic polyurethane mouldings have air capsules inside to help absorb car park nerfs and nudges. They also look pretty cool, as indeed does the rest of the C4 Cactus. We've become slowly accustomed to this design language with the C4 Picasso, but the Cactus takes things a stage further. Drawing its inspiration from the C-Cactus show car, a vehicle that Citroen's top brass once deemed too extreme, the party line seems to have softened since then even if the styling hasn't. But then that car first appeared on show stands seven years ago. Tastes have changed in the interim. The body marries smooth curves with bold, planar surfaces, indented with slick details like the Airbumps, the slot-like daytime running lights and the arc-like roof rails. There's a lot to take in. The cabin has had a lot of design effort poured into it. Everything feels soft and relaxing, with squidgy seats and a simplified dash that features a touch screen to house most of the minor controls. In an industry first, the passenger airbag is housed in the roof, freeing up the dash area to feel lighter and airier. The front seat is bench-like but only seats two and cost and weight has been taken out of the rear with the simple, non-split rear seat and the basic front-hinged rear windows. There's a 358-litre boot, extendable to 1,170-litres. Prices start from around £13,000 and all models get a digital Touch Drive interface controlling things like automatic air conditioning, a DAB radio, sat nav, a reverse parking camera, Park Assist, cruise control and Bluetooth connectivity. Citroen claim that there will only be one body style for the C4 Cactus, but clearly that's going to be contingent on sales. If the Cactus is a massive hit, there would undoubtedly be bigger/smaller/faster Cactus models coming on stream. The question that hovers over the Cactus is whether Citroen has gone a little too far with this car for popular taste. There was something in the water at Renault in the Nineties when it designed the Vel Satis, the Sport Spider and the Avantime; all cars that were resolutely bold and packed full of novel ideas but which nobody bought. Has Citroen fallen into the same trap? The underlying reasons for producing all these cars was much the same, namely that the manufacturers all reckoned the sectors these cars were competing in had become somewhat staid and would respond to an injection of new ideas, but it's easy to underestimate the conservatism of car buyers. The Cactus range comprises a 1.2-litre three-cylinder petrol units and 1.6-litre diesels, with prices starting at around £13,000 stretching to around £18,500 for all the bells and whistles. There's scope for customisation, with a broad range of colours and the Airbumps can be specified in four different colours too. Weighing from just 965kg, the model is 200kg lighter than an equivalent Citroen C4. As a result, Citroen has been able to adopt smaller engines to improve efficiency, without compromising driveability. Combined with ultra-low rolling resistance tyres, the latest-generation PureTech petrol engines and the BlueHDi diesel unit offer a responsive drive whilst delivering impressive combined fuel economy figures of up to 91.1mpg and CO2 emissions from just 82g/km. The C4 Cactus is offered with four efficient powertrains, three petrol - PureTech 75, PureTech 82 and PureTech 110 - and a BlueHDi 100 diesel variant. Engines are mated to either 5-speed manual or 5 or 6-speed ETG (Efficient Tronic Gearbox) transmissions. The diesel model puts out just 90g/km of CO2 and is therefore eligible for free VED. There is even a VED-exempt petrol version - the PureTech 82 S&S ETG - which emits just 98g/km. The weight-saving measures also reduce wear on other consumables, including tyres and brake pads. The Citroen C4 Cactus might look as if it's just driven off a motor show stand, but questions remain as to how many buyers are looking for something quite so extreme. There's also the inconvenient fact that once you've got past the flourishes of a stylist's pen, the mechanicals, driving experience and equipment levels of the car are rather average. So is this a car that's all style and no substance? Not really. It's hard to argue with something that puts a smile on your face yet can return fuel consumption figures in the nineties. Anything that makes frugality a little more fun is to be welcomed and there ought to be a place for the C4 Cactus in a congested automotive market. Keener drivers will probably still look elsewhere, but if you want a low-mileage urban scoot that looks great and is easy to drive, the C4 Cactus answers the call. Sure, they sound an undemanding set of criteria but sometimes it pays not to over-analyse. Just don't underestimate the amount of work Citroen has put into making the Cactus such a simple pleasure.